Cold and flu season is here, so we’re having a sale to make it easier for you to stock up on wellness items! 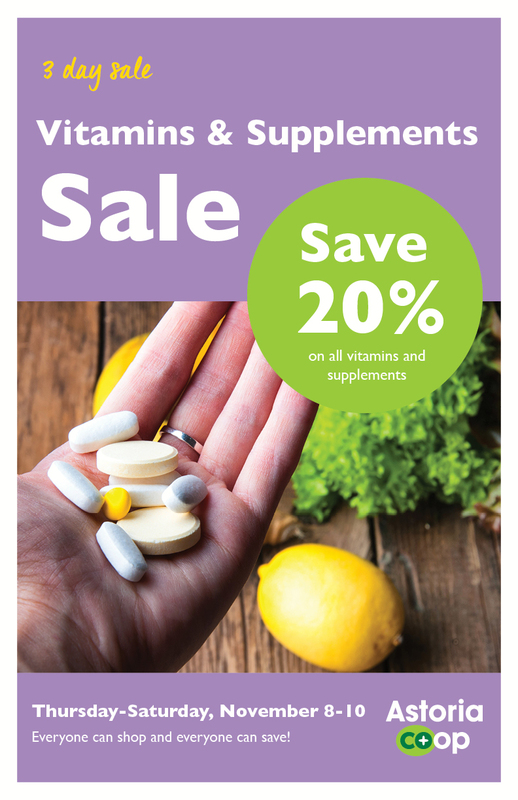 Thursday through Saturday November 8-10, save 20% on all vitamins and supplements, including probiotics, protein powders, fish oil, CBD products, homeopathic remedies, immunity boosters and more. Everyone can shop and everyone can save! Hurry, hurry, get your turkey while supplies last! Your co-op has high quality turkeys at competitive prices. View our latest Fresh Deals flyer. Please note: all turkeys are frozen and will need time to thaw in your refrigerator, roughly 24 hours for each 5 pounds. 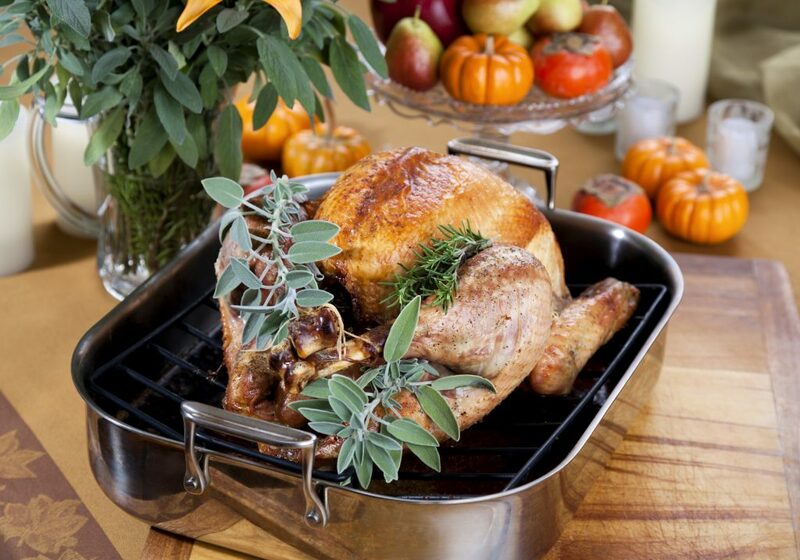 Learn more with these turkey roasting tips. Our turkeys are available first come, first served. We recommend purchasing your turkey as soon as possible, to ensure supply and to give you the size you want. Organic Prairie Whole Turkeys: These certified organic turkeys roam freely with unlimited access to fresh air and sunshine. The birds are raised with the strictest organic production and humane treatment standards by family farmers are serious about the health of the land, animals and you. These are priced at 2.99/lb. This is a dollar lower than we found at the competition! Sizes range 10-18 pounds. Available now! Diestel Bone-In Turkey Breasts: This farm raises its birds with fresh mountain water and clean air in the Sierra Nevada Foothills. Feed never contains fillers and the birds never receive growth stimulants or antibiotics. These all-natural, slow-growing turkeys have plenty of time and space to develop, resulting in juicy and tender meat. We had many requests for these last year and are happy to now be able to provide them for smaller holiday meals. Available starting November 16. Own a grocery store with us! Everyone is welcome to shop at our co-op, but there are benefits to ownership and during our owner drive there are extra incentives to join including 20% off a shopping trip, a chance to win a $200 co-op gift card, and a free tote. October is National Co-op Month so it’s an especially important time to talk about what it means to be a co-op. We are a community-owned grocery store, a consumer-owned cooperative. Our shareholders are regular people just like you who elect a board of directors to oversee the store and staff carry out the day-to-day work. Co-op owners save 10% (or more) on shopping trips during owner appreciation weeks four times per year. They can also order cases of their favorite products and save 10%. All co-op profits are either invested in enhancing the store or shared with owners in profitable years. By becoming an owner of the co-op, you contribute to a vibrant local economy that puts people before profits and keeps more of your dollar circulating within the community. Some examples include expanding the marketplace for locally-grown food and supporting good jobs. Learn more about the benefits of co-op ownership and how it works. Join thousands of your friends and neighbors in owning Astoria Co+op. Click here for an application. 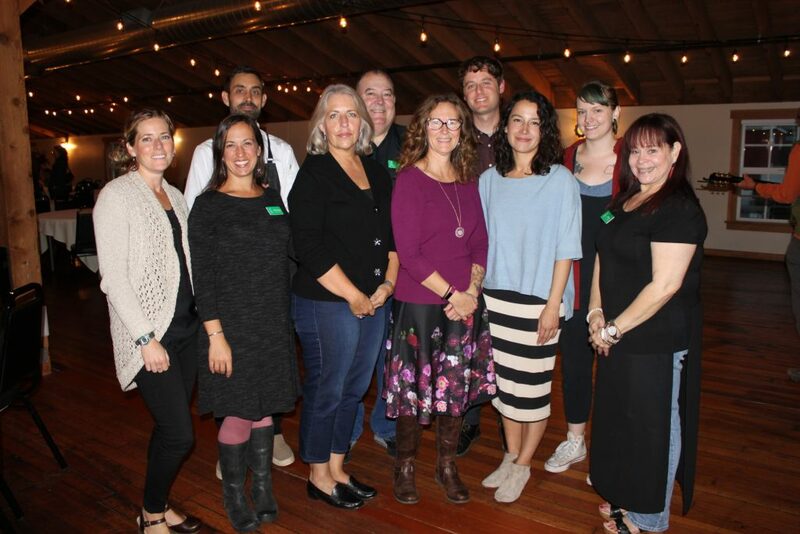 Our annual meeting 2018 is in the books! Everyone is welcome to shop at the co-op, and anyone can become an owner of our grocery store. Part of community ownership includes an annual meeting to learn about the business and vote for board members who oversee it. In our General Manager’s annual report, Matt Stanley says our new store expansion is right on track for our five year strategic plan. It has involved a rigorous land use process, including a compromise to make neighbors happy in a way that works for the co-op. Now it’s time for engineering and financing. There’s still an opportunity to make a truly local investment, as there are $820,000 in preferred shares still available for those interested in investing. In October 2017 the co-op launched an owner investment campaign raising $1.6 million in 8 weeks. Our co-op is weathering the challenge of more competition, thanks to your support. The new store will help the co-op to become a destination to even more shoppers, with increased visibility and more space for great food including locally-sourced products and a deli with hot food. “Based on research and evidence we have from other co-ops, we need to get out there and be visible to be relevant and be in this community for another 40 years,” Stanley said. Our expansion timeline is fluid, but your co-op could break ground as soon as January and construction is expected to take about a year. Stanley concluded his report by saying how excited he is to grow so we can provide a bigger community impact including access to more healthy and local food. Click here for expansion updates.